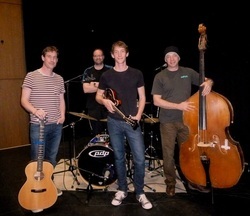 Malachy and the Country & Northern band recorded a new E.P. in October, in the Mareel arts centre in Shetland, which is now available for download or on CD. You can find out more on the E.P. page. There is a new website for Malachy's non-musical writing at www.malachytallack.com. A limited edition CD, Country & Northern, was released at the beginning of May 2012. The songs can be heard free on this site. Malachy is releasing a new album, 'Country and Northern', available as a free download. See this page for details. Two of the last three British veterans of the First World War - Henry Allingham and Harry Patch - died in July. Only Claude Choules, now resident in Australia is left alive. Malachy's song, Last Man Standing, is available to listen on the Media page, and his Shetland Life editorial on the subject can be read here. 24.6.09. Album of the Week! from the thorn is album of the week on Iain Anderson's excellent BBC Radio Scotland show. The programme website is here. The first review of the new album is now available to read online, and it's a good one. You can read it here.